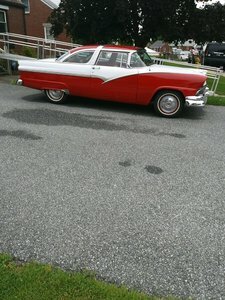 This 1957 Ford T Bird is celebrity owned so is meticulously cared for, and has the 312 Y Block V8 with automatic transmission, 1406 Edlebrock carburetor, and is in the perfect color combination with nice white paint and a newer bright red interior. Convertible with removable hard top with upgraded power brakes with disc up front, power steering, power windows, power seat, and lowered 3 inches for that just right ride height. Kelsey Hayes style wire wheels finish off the look, making her one star struck showy bird. Offered at $62,500 OBO. For more information please visit our website at www.classiccarmarketing.net or call us at 619-972-7073. Please mention the vehicle you are inquiring about so we can respond promptly. Inspections are encouraged before any purchase, of any vehicle, anywhere.